If you are considering submitting an article or wish to discuss possibilities, please contact the editor, Selga Harrington asap. Email at selga.harrington@gmail.com. Reviewers get to keep the review copy of the book. Myrtle Rust has recently been confirmed in the Cairns Regional Council Nursery in Mossman in Far North Queensland and in the residential garden of one of the nursery staff. The detection in the residential garden is the first detection of myrtle rust in the environment (i.e. outside a nursery situation) in Far North Queensland. For more information on Myrtle Rust check out Bob Makinson’s recent Myrtle Rust Update. The Australian Weeds Committee has declared an additional 12 Weeds of National Significance (WoNS) based on their economic, environmental and social impacts and potential to spread. Some of the additions are for whole groups of related species (Brooms, Aparagaus weeds, Opuntioid cacti). Governments from more than 90 countries have agreed to establish an independent panel of scientists to assess the very latest research on the state of the planet's fragile ecosystems. The decision, which will create a body akin to the Intergovernmental Panel on Climate Change (IPCC), was made 21st April in Panama City, after years of negotiations. The Intergovernmental Platform on Biodiversity and Ecosystem Services (IPBES) will be responsible for producing international scientific assessments on issues such as ocean acidification and pollination, to help policy-makers to tackle the global loss of biodiversity and degradation of ecosystems. More information can be found in this Article in Nature and the IPBES website. Plant Reintroduction in a Changing Climate: Promises and Perils, presents a comprehensive review of plant reintroduction projects and practices, the circumstances of their successes or failures, lessons learned, and the potential role for reintroductions in preserving species threatened by climate change. Contributors examine current plant reintroduction practices, from selecting appropriate source material and recipient sites to assessing population demography. The findings culminate in a set of Best Reintroduction Practice Guidelines, included in an appendix. These guidelines cover stages from planning and implementation to long-term monitoring, and offer not only recommended actions but also checklists of questions to consider that are applicable to projects around the world. A literature review, commissioned by the Scottish Natural Heritage, reviews the application of species translocations as a conservation tool for the establishment or protection of populations in northerly and/or montane environments. The current generic debate concerning translocations and climate change is reviewed, and application of this technique to three species groups: lichens and bryophytes, vascular plants, and invertebrates considered. The application of various ecological modelling techniques to the issue of species translocation and climate change is also considered and key research questions that might be addressed by experimental study are proposed. identify plant conservation directions in Australia for the coming decades. 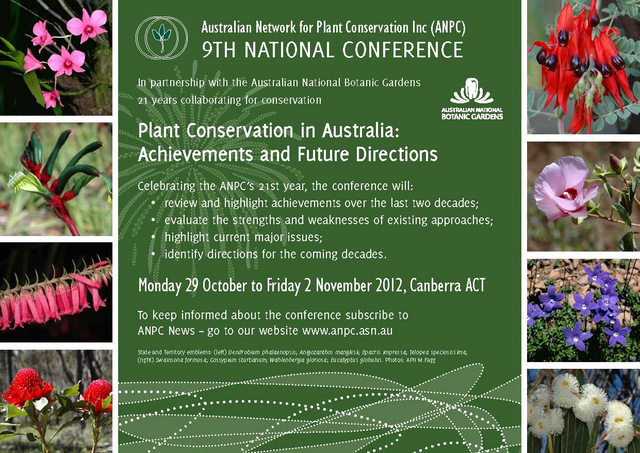 This conference is being held in Canberra from Monday afternoon 29 October to Friday afternoon 2 November. ‘Managing Ecosystems – establishment and resilience’ is included in the list of topics for which abstracts are invited. More information, including a call for abstracts, can be found here. The Australasian Systematic Botany Society will hold their 2012 conference in Perth 23-28th September 2012. The conference theme, Local knowledge, global delivery, follows from last year's landmark International Botanical Congress in Melbourne, where sweeping new changes surrounding the publication of new taxa were proposed. Electronic publication came into effect at the start of 2012, marking a new era in the communication of local research to a world wide audience. We are also in a time of rapidly advancing technologies, which has seen the development of new online tools for compiling and delivering systematic information. To this end, abstracts are invited on biodiversity informatics, web-based collaborations, electronic publishing and eFloras. Abstracts are also invited on local endemism, pollination and biodiversity threats such as climate change and plant pathogens. Students are strongly encouraged to attend and present their research, even if their projects are in their infancy. Abstracts are due by 30 June 2012. More information available on the conference website. Land and sea country are terms used by Indigenous people in northern Australia to refer to the environments they have managed for millennia. The philosophy underlying land and sea country management of passing on the knowledge and values inherited from ancestors to descendants is widely shared by conservation biologists across the globe. The meeting will showcase Indigenous conservation management while highlighting the tools and knowledge now available to all conservation practitioners in caring for land and sea country. Symposia and workshop suggestions on any topic relevant to conservation biology in the region are welcome. Abstracts due 15th May and Early Bird registrations close 1st July. More information available from the conference website. Are you a Council, CMA, Landcare group, other NGO or private landowner who would like to plant locally native, bio-diverse forests that can be utilised for carbon trading? Blacktown City Council and Liverpool Plains Shire Council partnered with their communities to do this, and wish to tell you how you can too through one of their Plan a Regenesis Forest workshops. Regenesis is a model for planning and planting locally native reforestation projects that create additional revenue for landholders to establish and maintain native vegetation. The Regenesis model provides a do it yourself kit to enable landowners, councils and other land managers to participate in carbon emissions trading schemes. Workshops will be run in the following NSW locations: Blacktown Friday 4 May, Orange Tuesday 15 May, Quirindi Thursday 17 May, Queanbeyan Tuesday 22 May, Bellingen Wednesday 13 June, Lismore Friday 15 June, Armidale Monday 18 June. Further information Contact the Regenesis team at regenesis@blacktown.nsw.gov.au, 0423 784 019.